Colors are a bit funky - that's walnut. 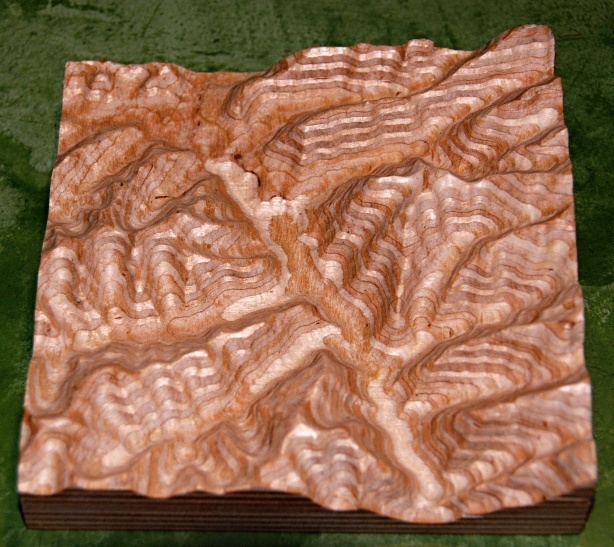 The piece is 4" square, 3/4" thick at the highest points, 1/4" thick at the valley bottoms. The vertical scale is very much exaggerated - the block represents about 2 miles square, but the height from bottom to top is only about 500'. This piece had finishing passes only in the horizontal direction. A second piece with both vertical and horizontal passes is smoother. Takes about 20 minutes to cut. Scale it for HO trains? Take a heck of a glue-up. Very interesting stuff going on there. Love that second picture! 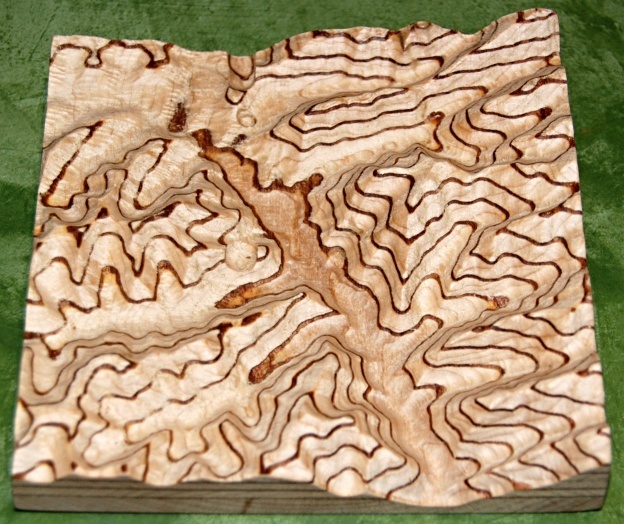 DRSTRIP: Have you done one in Baltic plywood? If so please post a pic. 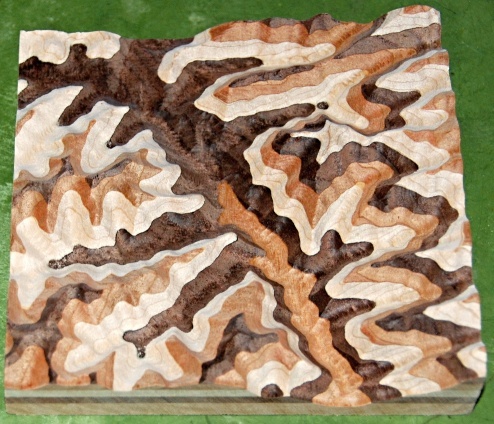 The bands in the ply and/or the glue lines would look like scaled elevation marks I think. Awesome! I love it, now I want one too..
DRSTRIP: My goofy old eyes are a confusing tool to view this. To me there is an optical illusion. The feature running from 11 o'clock upper left to the 5 o'clock lower right with the two features at 7 & 8 o'clock have me confused Are those features valleys or ridgelines. All in all I like the maple and rosewood plaque much better. I originally thought there would be more contrast between the plies on the BB. Will you be able to expand the square to make a larger tile and do you have plans for where those tiles will go? Just for giggles could/would you post a pic taken at an oblique to the top of the tile? These are super cool. They would make great gifts. 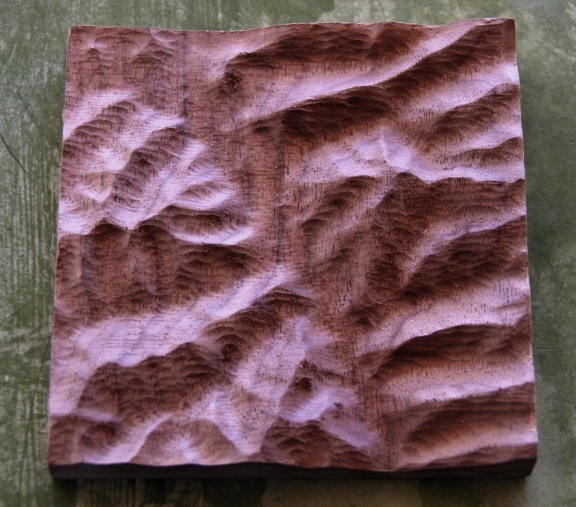 You could do maps of special spots people have, frame them and you've got a great gifts.